Too bad it’s only confined to deviantArt, where much awesomeness awaits chance discovery. 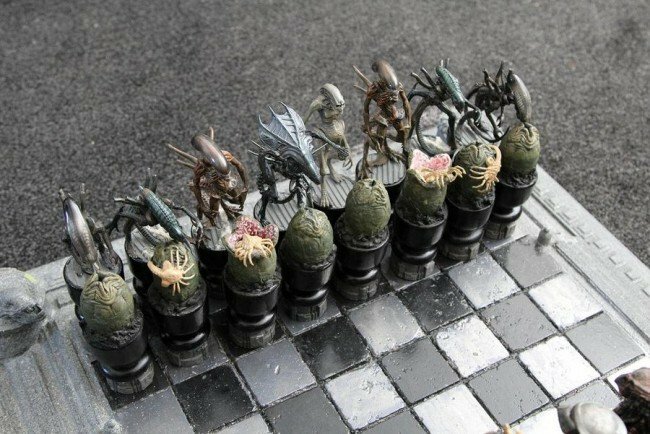 Seen below is 1/2 of a novel chess set allegedly made by user joker-laugh. The detail is incredible–if the Xenomorphs look rad, try the source link down south for a glimpse of the Predators. Also, if youre a big fan of the series, the Xenomorphs are actually modeled after their different incarnations across the saga. You can barely see the Predators arrayed at the edge of the pic, but rest assured they’re every bit as impressive as their foes. AVP seems to be getting a new lease on life these days. It all went awry with those movies a few years ago and the big change likely came from the revival of the AVP video game, which was fine. Hopefully, the upcoming Prometheus will go the distance and deliver the franchise to its lofty perch as a cult property rather than b-movie fodder. Anyway, since this appears to be more of a one off, don’t expect it to reach a store near you soon.